About meI am an Englishman. I work in the computer industry, trying to interface between the business people and the techies, but it's hard, so hard. I don't blog or anything, but I do get addicted to internet sites until I burn them out of my system. Currently, I spend most of my life on Wikipedia ... oh - alright, I mean LibraryThing. About my libraryI was a bookworm as a kid, and devoured Golden Age science fiction. Fiction was all I read, until a friend recommended 'The Selfish Gene' by Richard Dawkins. I've never looked back, and have a growing number of popular science books (and growing faster than being read). Most of my library was sitting in boxes in the garage, just waiting for me to get my house in order. I have finally started the cataloguing process: only the science fiction left to do! Stop Press: Thanks to aethercowboy, I’ve learnt how to put tabs in talk posts, as described here. Details below. Older (and nicer) tag view which you get using <a href=/tags.php?view=username>tag view</a>. When viewing my catalogue using my preferred display style, I recommend that you first sort on 'Stopped' and then sort on 'Started'. This will show my recently read books. The image is from the t-shirt of the book of the comic Watchmen. - 0 will show you dates based on start/finish times or date bought values (if there are no start/finish times). - 1 will show you a timeline based on the date the book was entered into LT.
As a member of the Combiners! group, I welcome comments pointing out any inconsistencies in my library entries. You can enforce a particular sort order for a book if you find that it is displaying in the 'incorrect' order in your catalogue listing. Usually (at least for English-language titles, and maybe some other European languages) the reason is that the sorting algorithm ignores words like "A", "An" and "The" at the start of the title. The trick is to put a double pipe - "||" - before the place where you want the sorting to start. Tim illustrates it here, and the rest of that thread may provide further information. I've forced long links (and, indeed, long strings of characters) to display in full by embedding HTML in the text, which seems to break the recognition software. I use <i></i>. Formatting in a post can be preserved using <pre> </pre> around your text. Using this, you can format charts, and the tab character (&#09;) helps with this. Tabs are preserved within the ‘pre’ segments, and can be cut and pasted, rather than entering &#09; for every occurrence. Beware, though, because ‘pre’ causes a blank line to be inserted before and after its use, so include the whole of your chart in a single ‘pre’ pairing. Go directly to a post in a thread by adding "#messagehead99" (where 99 is the post number). <a href=/talktopic.php?topic=16986#messagehead50>post 50</a> takes you to one of Tim’s comments about future development priorities. When posting a link to an external URL in the Groups, you must put a space before and after the URL in order for it to become an automatic link. ETA in a group message means 'Edited to add'. OP in a group message means 'Opening post'. Disambiguation notices and descriptions have different rules for HTML, and one useful command is to use <p> to force paragraph breaks when carriage return fails. WikiThing is a repository for information about LibraryThing. It is new, and is being populated by members of the LT community, so that means YOU! Please help. At the moment things may seem a little disorganised because people are just finding their feet and experimenting. Discussions still belong in the groups, and discussions about WikiThing are ongoing in the WikiThing group. You can now add your WikiThing link to 'Also on'. Activate the link to your WikiThing page by using 'Edit profile/account settings' on your Profile page. I would tell you how to post images, but GreyHead has already covered that ground. Hmmm. 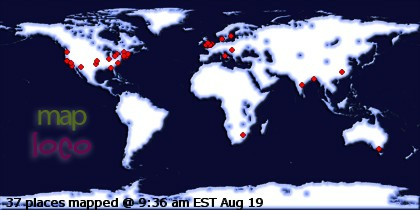 Your visitor map doesn't seem to have changed recently? You probably need to bypass your cache. If you are using MS Internet Explorer or Mozilla Firefox browsers, this is done by pressing [CTRL]-[F5] (at the same time). My profile page has been visited times since 28AUG2007. View my statistics from http://www.statcounter.com/ here.